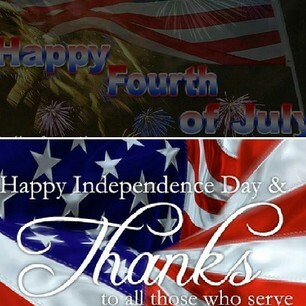 Happy Independence Day, loves!!! I hope you’re fully appreciating this day and its meaning. It holds extra significance for me this year with my brother in the armed forces as well as my cousin. They are both coming home today and I was thinking what better way to salute their sacrifice then to illustrate our gratitude–through song. Check below for an amazing Thank You vid to our Freedom Fighters. YOU GUYS make it possible for us to have the BBQs, watch the stream of colors in fireworks and feel safe doing it. Thank you for all you do to protect us and our country. Without your sacrifice we wouldn’t be able to reach another birthday. Happy Birthday, America.